Crews will continue work on remaining sewer laterals. This work will occur on Haight Street near the intersection of Haight and Fillmore. The “no parking” barricades will be placed at locations where sewer lateral and/or culvert work is to be performed. This work will not impact sewer service. On Scott Street, south of Hayes Street, the Contractor is expected to complete the installation of the sewer main, a drainage culvert and two manholes. The contractor will begin sewer main replacement on Hayes Street between Lyon and Central streets. On Haight St, between Scott St. and Buchanan St., the contractor will begin sewer main trench restoration work. The sewer trench restoration work on Haight Street, Scott to Buchanan, is expected to take 2.5 weeks to complete barring any weather delays. The water lateral connection work is tentatively scheduled to commence towards the middle of the week on the 1400 block of Haight Street. Feel free to contact Alex Murillo if you have additional questions/concerns. Also, please invite your neighbors to visit our project page and sign-up for email updates. The DPW project page is www.sfpublicworks.org/haight-hayes. Thank you. Each of these roped-off squares will be planted with one of the trees bought by the Alamo Square Trees for Future Generations fundraiser! Thank you to all our donors and the Alamo Square Neighborhood Association! The contractor has completed the sewer main replacement work on Hayes Street between Scott and Divisadero streets. This week, the contractor is replacing sewer laterals on the north side of this block. On Hayes Street, between Scott and Divisadero, the contractor will begin replacing sewer laterals on the south side of the block. The contractor will complete the sewer work on Hayes Street between Scott and Divisadero streets. Sewer main replacement work is tentatively scheduled to commence on Hayes Street from Lyon to Central the week of October 24, 2016. On Haight St, between Scott St. and Buchanan St., the contractor will begin sewer trench restoration work. The trench restoration work will begin at the Haight and Scott streets intersection and proceed in an easterly direction towards Buchanan Street. The contractor is anticipated to complete this phase of trench restoration work by the first week of November. The bus stops at Pierce, Fillmore and Buchanan will be temporarily relocated as work progresses along Haight Street. Bus stops will be relocated to mid-block locations. The “no parking” barricades will be placed at locations where trench restoration work is to be performed. For additional information on the project please visit www.sfpublicworks.org/haight-hayes. Also, please invite your neighbors to sign-up for email updates by adding themselves to the distribution list via the webpage. Thank you. 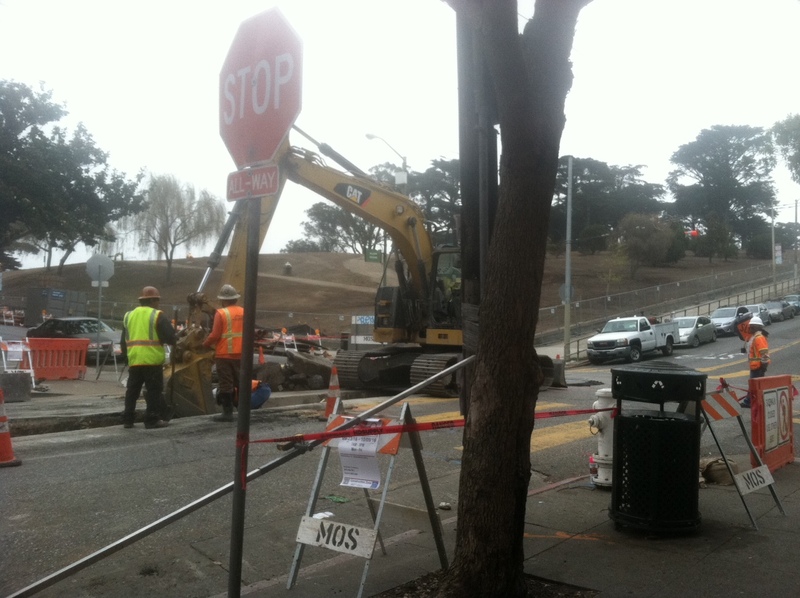 Crews continued sewer lateral work on Haight Street between Fillmore and Steiner streets. The lateral replacement work on this block should be complete next week. Also this week, the contractor continued sewer main replacement work on Hayes Street between Scott and Divisadero streets. The mainline work on this block is expected to take another 2-3 weeks to complete. Once work on the main line is complete, crews will schedule sewer lateral replacement on the block. Crews will also continue sewer lateral replacement work on Haight Street between Fillmore and Steiner streets. The contractor will then continue localized sewer lateral replacement work on Haight Street. The “no parking” barricades will be placed at any locations where lateral work is to be performed. This work won’t impact sewer service. Sewer main replacement will continue on Hayes Street between Scott and Divisadero. For additional information on the project and to sign up for email updates, please visit www.sfpublicworks.org/haight-hayes. Please join us at a community forum to discuss the issues most important to D5 residents. Format: Moderator will select questions to ask the candidates. Event moderator: NUALA SAWYER, Journalist and ASNA board member! Nuala is a freelance reporter who focuses on local SF news. For three years she worked as a staff writer for Hoodline, covering crime, politics, transportation, housing, development and the arts in District 5. Visit www.nualawrites.com for more information about Nuala Sawyer. Thank you for your continued patience, support, and interest in the Wiggle Neighborhood Green Corridor Project. Some near term improvements have been installed in the neighborhood during the first half of the year and a few more will be rolled out through the fall. The project will complete design later this summer and construction will start in early 2017 and end in early 2018. Please go to the project website for background information, project elements, and schedule. You may have noticed some improvements have been installed in the neighborhood during the first half of 2016. “Painted safety zones” were installed at Oak Street and Scott Street and at Fell Street and Scott Street to improve visibility between pedestrian and motorist and encourage motorists to turn at slower speeds. The bike lane along Scott Street was widened and painted green to better indicate space for vehicles and space for people who ride bikes. A few weeks ago, a “leading bike interval” with new bike signals was installed for cyclists traveling northbound at the intersection of Oak Street and Scott Street. The leading bike interval allows people who bike to enter the intersection before vehicles and facilitates the transition to the left turn bike lane one block north at Fell Street and Scott Street. Restrictions on vehicles from turning left from Divisadero to Hayes Street and McAllister Street during peak periods have been implemented to reduce vehicle queuing and improve travel time for the 24- Divisadero. Still to Come in 2016! 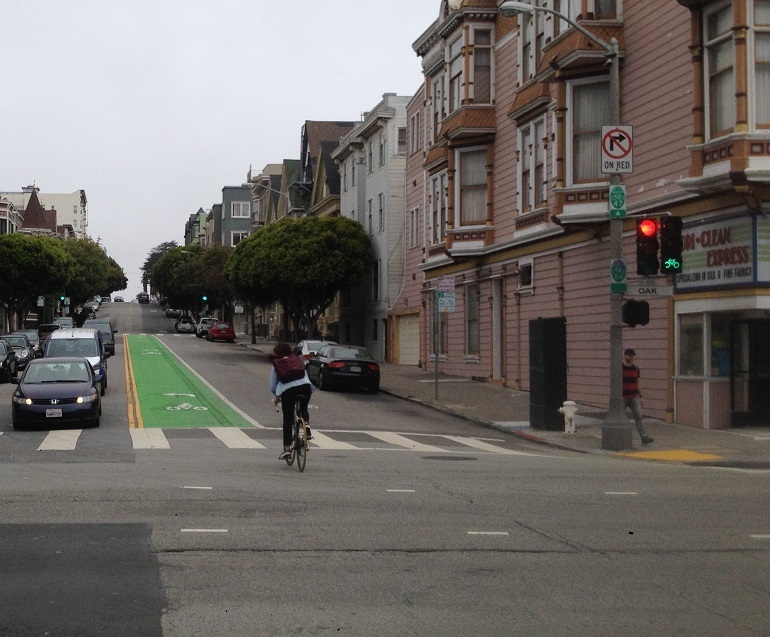 Signal timing changes to improve signal progression on Divisadero are expected to be complete and implemented in the fall. Traffic signals between O’Farrell Street and Hayes Street will be coordinated with the intent to improve traffic flow, travel time, and the operations of the 24-Divisadero. A raised crosswalk (similar to a speed hump) will be installed later this summer at the intersection of Hermann Street and Steiner Street. 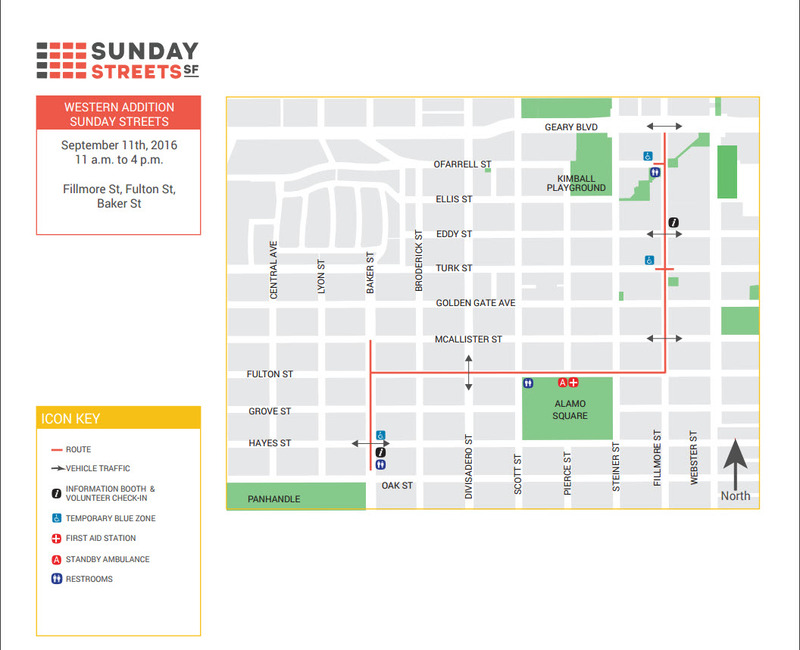 The raised crosswalk will encourage motorists and people who ride bikes to yield to pedestrians, prioritize people who walk between Duboce Park and the east side of Steiner Street, and encourage motorists and people who ride bikes to travel at slower speed. Public Works is nearing 100% design for the construction of the project and it is expected to be complete in August. Following 100% design, contractors will bid on the project with the construction contract awarded this fall. Once the contractor has been secured, the sequencing of construction for the project improvements will be determined by Public Works, the SFMTA, and the contractor. It is expected that construction will begin in January 2017 and last 12 months.